In this section, we offer some basic tips for preparing the first draft of your proposal. DO start in plenty of time to prepare your proposal. DO read the call for the proposal (CFP) very carefully and follow all the recommendations regarding formatting and fonts. DO cover all the criteria listed in the CFP. DO submit the proposal by the deadline. In the abstract, include WHAT the project is about, WHY it is important and HOW you will carry it out in the abstract. DO explain how it fits into current work (the 'state of the art' in your field) in the introduction. DO include all relevant references in peer reviewed international journals. DO explain in detail how you will carry out the project including how you will deal with possible problems that might arise. DO NOT exceed the page limits either on individual sections or on the proposal as a whole. DO NOT include only local references or only your own work in the literature review. DO NOT include extraneous material that is not required in the CFP. DO NOT annoy the reviewers by using poor grammar or spelling or by using jargon or undefined acronyms. Writing a proposal will, of course, require a significant amount of refinement and re-drafting. And yet more re-drafting. DO leave plenty of time for writing your proposal before the deadline especially to allow time for re-drafting. DO have at least two or three colleagues read over your draft and make suggestions for any improvements. DO have people from outside your immediate colleagues read your draft for clarity if this is possible. DO take advantage of any program organized by your department or institution to review your proposal externally before submission. DO take any comments or suggestions seriously although you do not have to incorporate all of them. DO NOT be the only person to read your proposal before submission. DO NOT feel threatened by critical comments but value them since they will likely improve your proposal. George H. Heilmeier (1936-2014) was a distinguished US research engineer who carried out pioneering work on liquid-crystal display (LCD) technology while at RCA. Heilmeier went on to become CTO of Texas Instruments and CEO of Bellcore, among other important technology leadership roles. While Director of the US Defense Advanced Research Projects Agency (DARPA), Heilmeier devised a set of questions which every researcher proposing a new project was expected to be able to answer. 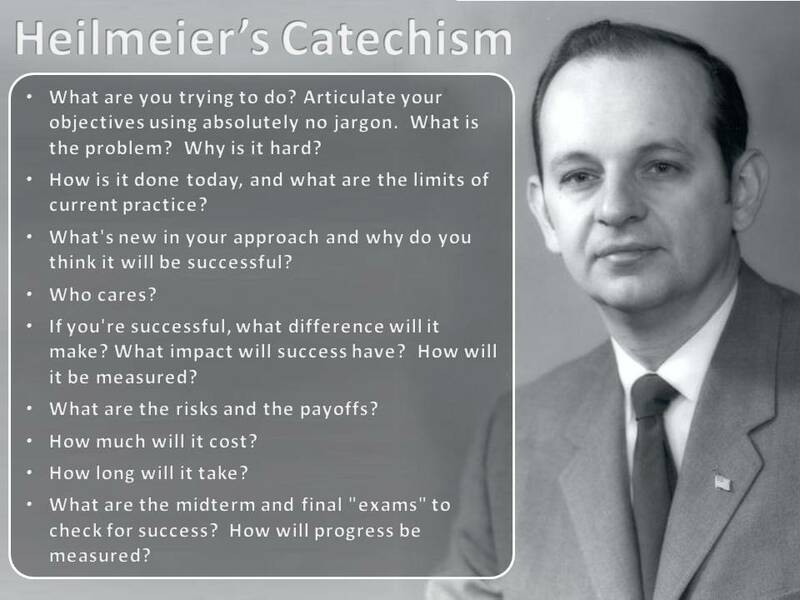 These basic questions, which came to be known as 'Heilmeier's Catechism', are still an invaluable tool for helping articulate the nature and value of any research proposal.